"Cease Firing - Peace Proclaimed"
I had always assumed that it was not much more than a conventional memorial to the end of the Civil War, that was until I took a closer look at the plaque on its side. Depending upon your point of view, either God or the Devil lives in the details. In the case of this monument, I think that a convincing argument can be made for the latter. Four dates are involved in telling the tale of this peace monument. The earliest date is April 30, 1861, which marks the incorporation of Atlanta’s Gate City Guard into the Confederate Army, little more than two weeks after the firing on Fort Sumter lead to the outbreak of the Civil War. According to the plaque, they did this “in the conscientious conviction of their duty to uphold the Cause of the Southern Confederacy.” This so-called “Lost Cause” rationale was the Confederate retelling of history that transformed their shameful fight to uphold the institution of slavery into a noble struggle in defense of states rights. A second date is that of a ceasefire somewhat disingenuously alluded to in the monument’s title. As far as I can tell, there was no formal declaration of “cease firing” that marked the end of hostilities of the Civil War. While it is true that Robert E. Lee surrendered the Army of Northern Virginia to Ulysses S. Grant at Appomattox on April 9, 1865, not everyone got the memo. And many of those that did get the memo ignored it. There was no shortage of Confederate dead-enders, as Donald Rumsfeld would have called them. Fighting continued sporadically for months. And a formal end of the war was only declared by President Andrew Johnson on August 20, 1866. 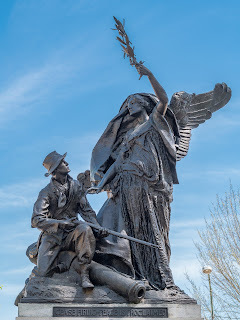 October 6, 1879 is the third date commemorated on the memorial. That was the date that the very same Gate City Guard “went forth to greet their former adversaries in the Northeastern and Eastern States, inviting them to unite with the people of the South to heal the Nation's wounds in a peaceful and prosperous reunion of the States.” Sick and tired of the bloody opposition to Reconstruction in the South, by 1876 the nation had decided to abandon its commitment to transform the political landscape of the former Confederate States. Although the Gate City Guard’s mission was, on its surface, a mission of reconciliation, it was, in many respects, a celebration of the Confederate triumph when it came to matters of race. The fourth and final date associated with the memorial is October 10th 1911, the date of its dedication. Almost thirty-five years after the end of Reconstruction, a prosperous and resurgent South had been brought back into the Union. Georgia Governor Hoke Smith attended the dedication. Although Smith was a member of the national Progressive Party formed by Theodore Roosevelt, fulfilling a campaign promise, he led the adoption of a constitutional amendment that effectively disenfranchised black Georgians. This revision marked the final nail in the coffin of any hope for racial justice that had propelled the Union during the Civil War and postwar Reconstruction. All gains that had been made in that regard had been turned back. Jim Crow reigned supreme.